Definition at line 427 of file detect.h. Definition at line 429 of file detect.h. Referenced by DetectBufferTypeGetDescriptionById(), DetectBufferTypeGetDescriptionByName(), DetectBufferTypeSetDescriptionByName(), and InspectionBufferApplyTransforms(). Definition at line 430 of file detect.h. Referenced by DetectBufferTypeGetByIdTransforms(), DetectBufferTypeGetByName(), DetectBufferTypeMaxId(), DetectBufferTypeRegister(), DetectBufferTypeSupportsMpm(), DetectBufferTypeSupportsPacket(), DetectBufferTypeSupportsTransformations(), and InspectionBufferApplyTransforms(). Definition at line 432 of file detect.h. Referenced by DetectBufferTypeGetByIdTransforms(), DetectBufferTypeSupportsMpm(), DetectBufferTypeSupportsMpmGetById(), and InspectionBufferApplyTransforms(). Definition at line 433 of file detect.h. Referenced by DetectBufferTypeSupportsPacket(), DetectBufferTypeSupportsPacketGetById(), and InspectionBufferApplyTransforms(). Definition at line 431 of file detect.h. Definition at line 435 of file detect.h. Referenced by DetectBufferRunSetupCallback(), DetectBufferTypeGetByIdTransforms(), DetectBufferTypeRegisterSetupCallback(), and InspectionBufferApplyTransforms(). Definition at line 428 of file detect.h. Referenced by DetectBufferTypeGetByIdTransforms(), DetectBufferTypeGetNameById(), DetectBufferTypeMaxId(), and InspectionBufferApplyTransforms(). Definition at line 434 of file detect.h. 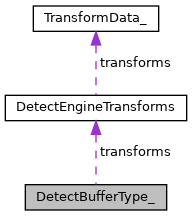 Referenced by DetectBufferTypeGetByIdTransforms(), and DetectBufferTypeSupportsTransformations(). Definition at line 437 of file detect.h. Referenced by DetectBufferTypeGetByIdTransforms(), and DetectBufferTypeMaxId(). Definition at line 436 of file detect.h. Referenced by DetectBufferRunValidateCallback(), DetectBufferTypeGetByIdTransforms(), DetectBufferTypeRegisterValidateCallback(), and InspectionBufferApplyTransforms().